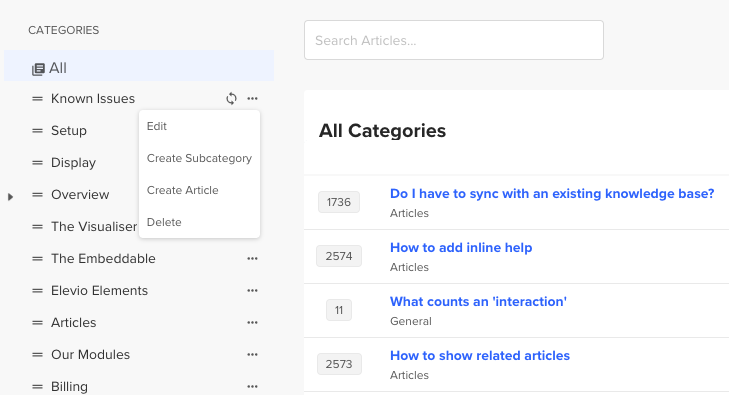 Use categories to sort your articles, so it's easy for your users to find what they're looking for. 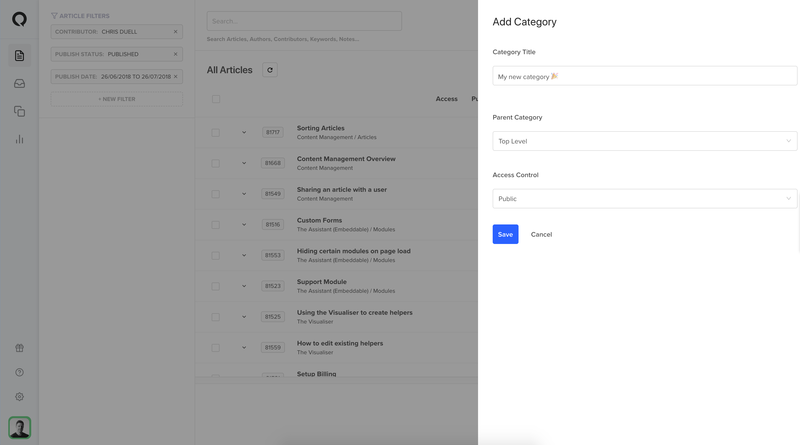 You can easily add, edit and reorder your categories so they make complete sense to your users. In the new Content Management dashboard, select 'New Category'. The 'Add Category' screen will slide open where you can create your category, give it a title, select its parent category and edit its access control. Select 'Save' when you are happy with your new category, or click 'Cancel' if you change your mind. To edit a category, hover over the menu icon on the the category that you would like to edit. This will open the editing menu for its respective category and provide a range of editing options, including the editing of parent categories. The 'Edit Category' screen will slide open and present the same range of editing options as the 'Add Category' screen. N.B. The option to edit categories is only available to users who have permission to publish. If you are unsure as to whether you have permission to publish, check out this article. Deleting categories is possible from both the category menu and from the category edit slide out. N.B. The option to delete categories is only available to users who have permission to publish. If you are unsure as to whether you have permission to publish, check out this article.